The WKV131 Wm.Knabe & Co piano is a full professional upright with sostenuto. A feature that is normally only available on grand pianos the WKV131 is a pianist’s dream. 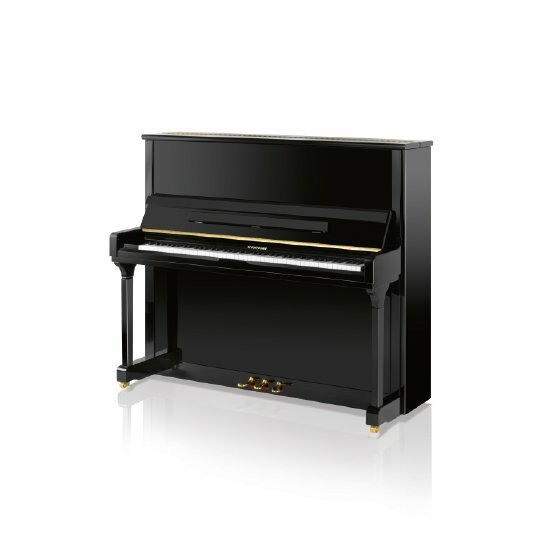 An upright concert piano it can create a full-bodied sound with great depth balance and expression. Appropriate for larger homes studios schools and halls. The WKV131 is made with high quality materials and an elegant design. Its tapered and contoured solid spruce soundboard is made from highly selected white Canadian spruce. With an additional back post to the smaller Knabe piano the five strong spruce back posts ensure that the piano strings tension is well supported by its back frame construction. The WKV131 features a sensational pure iron ore plate made in the traditional method of slow sand casting. An elite premium action made of winter cut North American maple this is the very heart of the piano. Premium Pratt Reed© spruce keys which are individually balanced and weighted what more could you want? The hammers are double coated t-wired Pratt Reed© premium hammers and individually voiced. The WKV131 uses Roslau© strings made in Germany. The 15-ply cross grained laminated hard rock maple pinblock prevents splitting and those tuning pins will stay in place guaranteed. With German diamond brand tuning pins made of rod steel it is a testimony to the Knabe piano legacy of craftsmanship. Additionally the WKV131 offers a slow close fallboard extra long music rest cast brass pedals and of course the sostenuto. Available in Ebony polish.